Hidden Door Concepts, the restaurant group behind several lifestyle and F&B concepts in Singapore, has unveiled Nickeldime on Mohamed Sultan Road. Serving premium international craft beers and contemporary pub dishes, the hangout offers a laid-back setting with its grungy vibes and graffiti brick walls. Helming the kitchen is Australian chief executive chef Tim Ashwood, who has more than a decade of global experience in the French dining scene, including stints at the Michelin-starred restaurant in Hotel Plaza Athenee in Paris. All food items are prepared in-house from scratch, using fresh, seasonal produce and fermentation techniques to optimise flavours. The international bar food menu features small bites and hearty meals, such as Duck Waffle ($25+ with GST, 10 per cent service charge applies), a crisp cheddar and thyme waffle served with confit duck, candy bacon and thyme maple syrup. 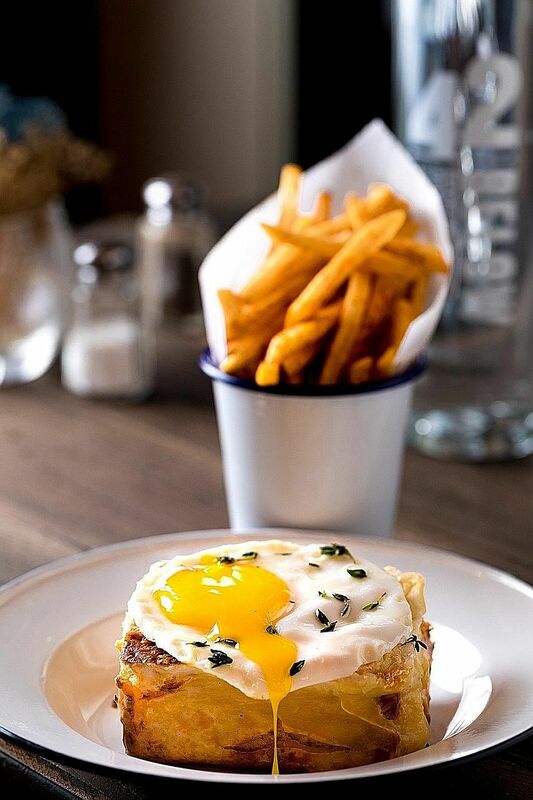 Another highlight is the modernised Croque Madame ($18+, above), prepared with housemade brioche, hand-carved ham, spiced bechamel and a fried egg. The dish, inspired by the chef's time in France, is his personal favourite. Nickeldime always has 16 international craft beers on tap. The selection ranges from the light and fruity, including Stone & Wood Green Coast Lager ($15+), to brews such as Pirate Life Mosaic IPA ($15+), Tuatara Coastin' Session IPA ($14+) and Heart of Darkness Director's Cacao Porter ($15+). Fans of DreamWorks' animated films can check out a new themed cafe at Bugis+ by the folks behind Gudetama Cafe Singapore. DreamWorks KouKou are characters from DreamWorks movies - such as Kung Fu Panda, Madagascar, Shrek, How To Train Your Dragon and Trolls - which are made to look like dumplings. "Kou" is the Chinese character for mouth. Here, in the world's first DreamWorks KouKou cafe, the Asian-inspired menu features seven main courses, six sides, five desserts and a range of speciality drinks. Mains include Night Fury Steak Rice ($18.50++), a Hamburg steak served with mixed vegetables and rice. There are also renditions of Singapore favourites, such asthe Signature K.B.P. or kong bak pau ($13++, above) - tender pork belly slices with fresh coriander, iceberg lettuce and chilli stuffed in steamed buns - and the Signature Warrior Dumplings ($12++), pan-fried chicken dumplings topped with ebiko and served with garlic aioli. Thai street-food concept The Original Boat Noodle, a franchisee of its namesake in Malaysia, has opened at Changi City Point. Boat noodle originated from the floating markets of Thailand and the portions dished out by the boat hawkers were kept small for convenience and safety. Here, it has been transformed into a modern restaurant-style dish, but has retained its small-portion serving (right). The concept started with only noodles, but the menu has grown substantially to incorporate more Thai street food as the number of Boat Noodle restaurants increased. At the 60-seat restaurant in Singapore, diners can experience a lively Thai street ambience from the food to the decor. The recommended dining style is to order the noodles - a few bowls, if you desire - and add side dishes and a signature drink. Repeat if necessary. For the noodles (opening special: $1.20++ a bowl), first choose your soup - Pathumthani (dark soya sauce, sourish and spicy broth) or Ayutthaya (creamy dark, mildly spicy broth) - then the rice noodles and meat choice of chicken or beef. Side dishes range from Tasty Chicken Wings ($3.80++ for three pieces, $5.80++ for five pieces) to Grilled Chicken/Beef Meatballs ($3.80++/$4.80++), Crunchy Thai Popeye's Tempura ($3.80++) and Flame Grilled Ayam Legend ($8.80++). For beverages, the Thai drink, Chill Chill, has almost all its ingredients imported. Choices are Thai iced tea or coffee ($3.80++ each) or the blended versions ($4.80++ to $5.80++).